September 23, 2016, 8:55 a.m.
As the new series of Strictly Come Dancing starts tonight, YouGov is kicking off a new tracker that we will be running through the entire series to measure the public&apos;s response to the rhumbas, judgement on the jives and feelings about the foxtrots. The initial research shows that overall, three in ten people say they intend to watch at least some of this series and singer Will Young is the contestant most people want to win (with 18% of the public with an opinion backing him). The next most popular are TV judge Robert Rinder and former Eternal singer Louise Redknapp (both on 13%). Young is the most popular contestant among all people over the age of 24, but is less popular among the under-25s with just 4% of 18-24 year olds wanting him to win. The most popular contestant among young people is I&apos;m A Celebrity presenter Laura Whitmore, and they are also far more likely to favour gymnast Claudia Fragapane and athlete Greg Rutherford compared to other age groups. Will Young is also the contestant that women most want to win (at 21% compared to 8% among men), whilst men would prefer a Louise Redknapp victory (16%, vs 10% for women). 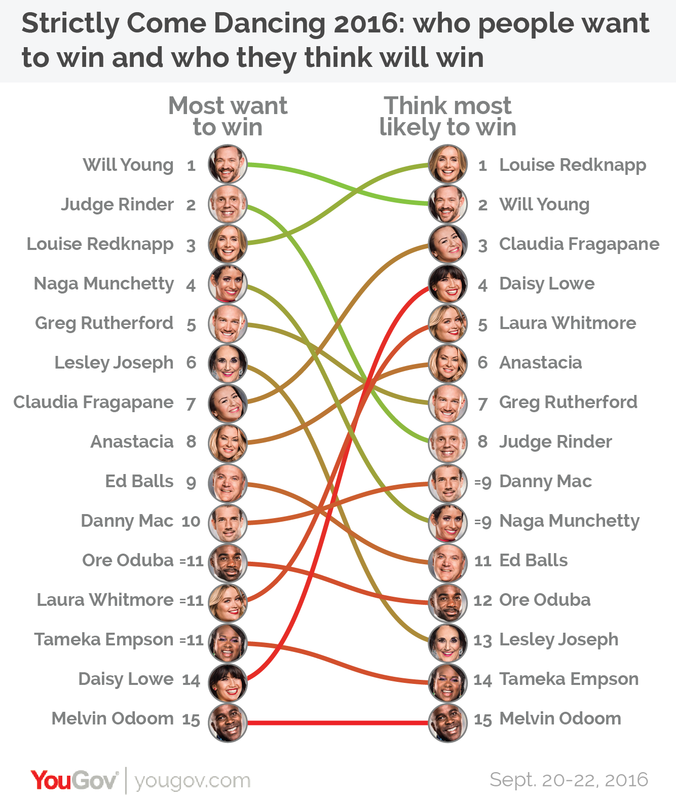 Despite being pipped to the post by Will Young and Judge Rinder when it comes who people most want to win, Louise Redknapp is the contestant the most people think is most likely to win, with 23% believing she will take home the glitter ball. Young is hot on her heels though (on 20%), but Judge Rinder’s popularity doesn&apos;t translate into an expectation to win as just 5% of people say they think he will win. It is worth pointing out at this point that these figures all exclude those who don&apos;t know who they want to/think will win. At this point, just prior to the first episode, 38% of people don&apos;t know who they want to win, and 56% don&apos;t know who they think will win. We can expect to see those numbers shrink over the course of the series as the contestants become more well known to the viewing public.